Are you in any business that requires transacting in foreign currencies? Do you wish to receive foreign currencies like Dollars, pounds, euro etc raw into your GTBank account without conversion? Then you need a domiciliary account. So with a domiciliary account here in Nigeria, you are able to deposit foreign currencies and as well, withdraw from the account when needed. This article will guide you on all the steps involved in opening a GTBank Domiciliary Account with simplified steps. Meanwhile, Guaranty Trust Bank has even made opening a Domiciliary account so easy and possible for all customers who intend to go for it. Before you can go for this GTBank Dorm account, there are some outlined requirements which you need to attend to. The requirements are listed below. · A copy of any utility bill issued within the last three months. Note: If you are already a GTBank customer with a Savings account, and want to open this Dorm. account, then you are required to provide two references before they can proceed in opening your own domiciliary account. For some banks, they may want you to deposit a minimum of $100 into the Dom account, which turns to be your own after the account registration. But GTBank Domiciliary Account doesn't ask for such, as you can fund your account when you so wish. To get references is as easy as ABC, as all you need to do, is to reach out to friends - this could be those bloggers that have a current account or any other eligible Current account holder with GTBank. During the process of opening my own Domiciliary Account with GTBank, I got a mail instructing that, if I have a current account with them already, that I shouldn't border about the above-listed requirements (references). The instruction further stated that all I need to do is to go to ANY nearby branch of Guaranty Trust Bank (GTB), at the Customer Information Service desk, with 2 reference form duly signed in order to request for the domiciliary account opening form. In case you don't have the current account, then no worries about that, as you can still start the account opening process, provided you have your two referees. Having taken note of all the above, let's proceed to steps on how to open a GTbank Domiciliary Account in Nigeria. 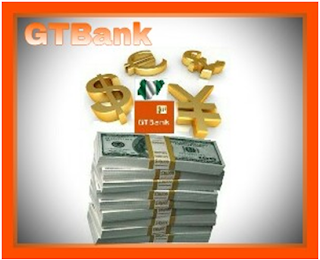 Steps To Opening A GTBank Domiciliary Account For Foreign Currencies. ==>1. First, proceed to any nearby GTbank branch with the expected documents mentioned above. ==>2. Meet with their customer service reps and request to open a domiciliary account with them. ==>3. Their first question to you will be, if you have a current or savings account with them, if you don't, they will immediately ask you to open either current or savings account with them. And after that, you can proceed to open the Domiciliary account. ==>4. Once you are done with the above step 3, you will be given a foreign currency account opening form, with specimen signature card, and two reference forms for you and that of your referee to fill. ==>5. Now, go ahead and fill the forms, ensure to give your two referees the forms meant for them to fill and then submit to the customer service. But should in case your two referees are not there with you in the bank, you can decide to take the form home and fill properly. Ensuring to give your two referees theirs to fill. NB: To speed up the process, it is important to use ONLY GTBank customers as referees, as in they should be GTbank current account holders; this is to enable the bank open and activate your domiciliary account within 48hours. ==>6. When you are done with filling the given form, visit GTBank again in order to submit. ==>7. When they collect the forms from you, they will access it just to make some necessary corrections, after then, they ask you to go home and wait. ==>8. In the process of waiting, GTbank will alert you with an SMS after or within 48hours, telling you, your domiciliary account has been opened successfully with your account number. ==>9. Finally, your Domiciliary account is ready to be used, just go back to the bank and deposit $100 into the account in order to activate the new domiciliary account fully. That's all about that, but before then, will like you to take note of below when Going for GTB Dom Account. · Just remember to request for the dollar card as you are opening the account, so as to make any online transactions you so wish, with the fund inside the Dom Acct. · You can as well open the domiciliary Account in other currencies such as Euros, Great Britain Pound and so on. · I will advise you to make use of Email alert. Don't opt in for GTBank SMS alert, unless you are ready for their SMS alert fraud. This is a Guest Post by Bob Michael. He is a Computer Scientist & A Tech Blogger. He Blogs at www.techbmc.com, where he simplifies series of Tech Tutorials and Bank issues. Like how much do they charge for account maintenance..? You have a daily spending limit of 1000USD. You can get dollar from BDCs or bloggers that have it for sale. The rate you will get it will vary based on market demands and the seller. Is Gtbank Dom Accnt. A Zero Account? Can One Withdraw Everything?